Macclesfield Forest is a popular area for families and dog-walkers. It also provides good birdwatching opportunities, with a variety of habitats. Although there is no public access to much of the forest interior, there are circular walking routes of varying length on well-maintained paths and tracks. Very little road walking is necessary with footpaths often separated from road traffic by a stone wall. We gathered in the layby alongside Trentabank Reservoir, from where we had good views of the heronry and 3 Cormorant nests. The weather was good – bright and sunny if a little cool at first. During the course of our visit we saw all six resident crow family members, including a Jay in the woodland and a Raven soaring above us. Both times we passed the Visitor Centre we saw a treecreeper searching for food in the stone wall on the far side of the road. We completed a circuit of the Ridgegate reservoir, starting through woodland to the south where we heard more birds than we saw. There were 5 female Goosander just out of the water on the stone bank of the dam at the western end of the reservoir. Returning to our cars, we drove to the car park at the eastern end of the Forest. From here we walked up towards the top of the forest on the south side. It was from here that we saw the Raven and several Curlew. Thank you to all who came and made this such an enjoyable trip. This entry was posted in Report, Sightings on 28th March 2019 by Webmaster. Attenborough Nature Reserve is situated on the northern bank of the River Trent and is managed by Nottinghamshire Wildlife Trust. 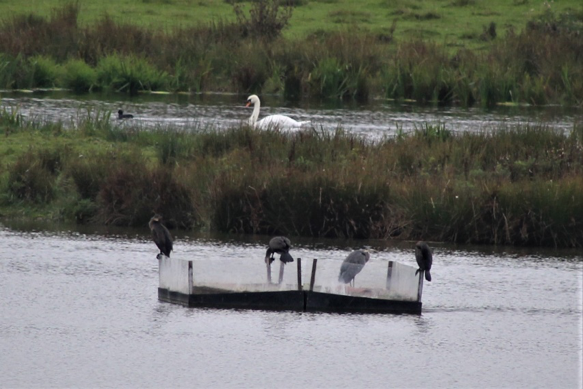 There are four hides, including an elevated one that gives good views over the ponds. The weather was cloudy, cold and mostly dry, with just a little rain as we approached the first hide. Some of the group had caught the train from Matlock. Those of us arriving by car couldn’t help but notice a group of birders with long lenses and bins peering into the hedge by the level crossing. The focus was on a Firecrest although there were other birds flitting around, including a Goldcrest. There had been reports of a Caspian Gull on the reserve. We may have seen it but we had to acknowledge that it could have been a Herring Gull! We had rather better views of a Green Woodpecker, a pair of Bullfinches, a Linnet and a Stock Dove. Although we had to compete with cyclists, runners and dog walkers, it was a very enjoyable, friendly and worthwhile visit. A site we shall return to without a doubt. This entry was posted in Report on 31st January 2019 by Webmaster. The Rother Valley Country Park, provides various outdoor activities for the public and includes a nature reserve. There are no hides but it was a dry day (if rather dull) and not too cold. We spent most of our time in the reserve but there were several birds to see on the main lake as well. Early on a skein of some 25 Pink-Footed Geese flew over and we spotted a female Red-Crested Pochard that was hugging the shallows in front of the island on the main lake. There were good numbers of Cormorant, Lapwing,Tufted Duck and Goldeneye to be seen. Seeing the range of habitat on offer, there was general consensus to visit this site in early spring next time. This entry was posted in Report on 29th November 2018 by Webmaster. Frampton Marsh RSPB Reserve borders The Wash in Lincolnshire. There are reed beds, grassland and salt marsh, giving varied habitat. In addition to the Visitor Centre, there are three hides. A chilly, breezy day that stayed dry until lunchtime. By the time we set out from the warmth of the Visitor Centre we had around 10 species listed and the list grew steadily through the remainder of our visit, culminating in the sighting of a Long-Billed Dowitcher in the afternoon that was busy feeding in the shallows, accompanied by a couple of Redshank. There were good numbers of Wigeon, Shelduck and Brent Geese. Hightide was over two hours before we arrived and may explain, at least in part, why we saw fewer waders than we might have hoped. Nevertheless, it was a very worthwhile trip. This entry was posted in Report on 29th October 2018 by Webmaster. After a very wet Friday we were blessed with a dry spell for our visit to Middleton Moor. The sun peeped through occasionally and the light improved towards the end of our circuit of the lagoons. Middleton Moor is a site with a mixture of habitat, including open water, shallow scrapes, scrub, woodland and moorland edge. There is a small hide overlooking the main lagoon. For much of the walk there were Meadow Pipits to be seen in flocks of varying sizes, mostly flying south but some feeding in a field. A few late swallows passed over too. We had good views of a Wheatear and a Kestrel, both with the help of Ken’s scope. This entry was posted in Report on 29th September 2018 by Webmaster. Many of our birds will have had a difficult time this summer, especially those newly fledged youngsters, coping with the record breaking temperatures and dry conditions we have all been experiencing. Only time will tell what effect it has had on them. It is good that a great many of us feed the birds in our gardens, helpfully putting out both food and water. Are there times you wish you could identify some of the less common birds that visit or when hearing one singing hidden from view amongst foliage have wished you could tell what it is from its song? 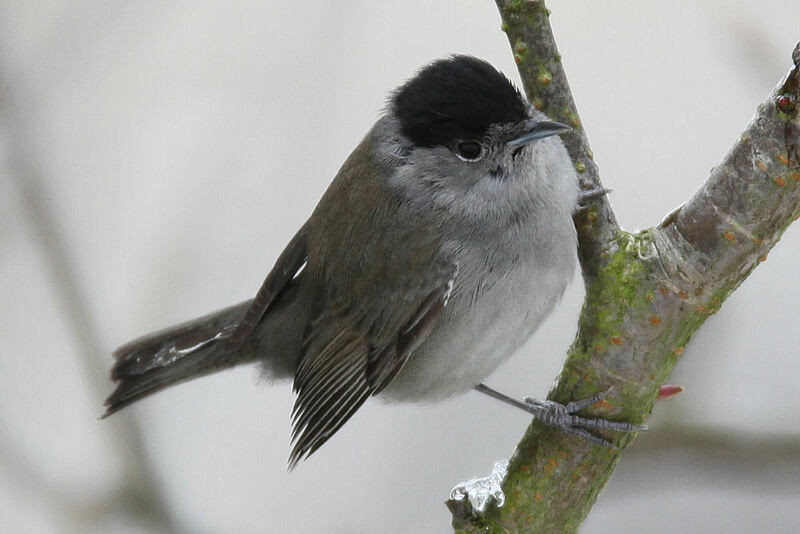 The Blackcap shown in our photograph is one of those birds that is often heard but not often identified. Or maybe you regularly walk in the countryside observing the birds as you go and can identify most of them, or are already a seasoned birder. Whatever the depth of your knowledge Bakewell Bird Study Group is sure to have something in their programme to interest you. On the second Monday evening of each month from September through April members and interested visitors meet at the Friends Meeting House off Matlock Street in Bakewell for presentations on bird related subjects. These are given by invited individuals, experts in their fields, accompanied by beautiful photography. 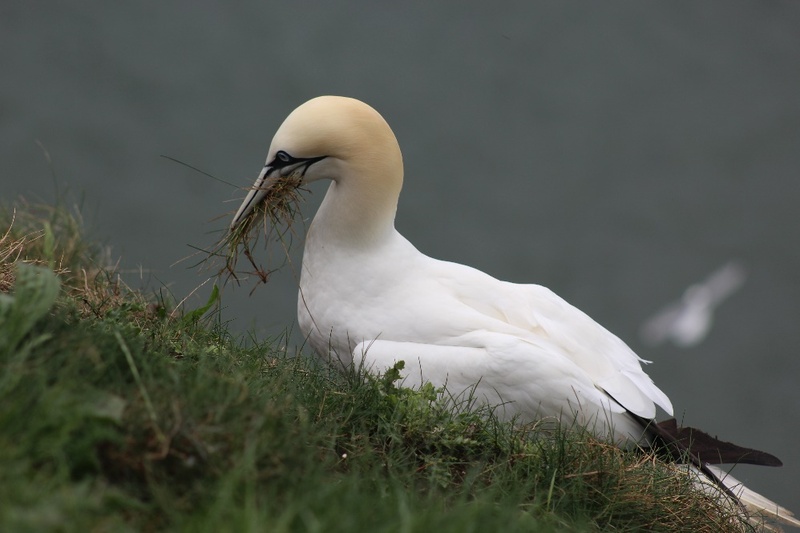 Walks and trips are organised throughout the year to interesting locations, sometimes coastal, where the more experienced members will assist with identification of both birds and birdsong. Our autumn programme of meetings commences at 7.30 on Monday September 10th with Nigel Slater giving a talk on Bird Migration. Nigel gave us a very entertaining and informative talk in 2017 and he is back by public demand. He will explain how birds know where they are going when they haven’t been there before and how they find their way. He looks at record breakers and the recent developments in technology which allow individual birds to be monitored continuously even when in Africa. Not to be missed! Why not come to our first meeting and join the group? It’s only £15 per annum and for that you get seven talks and a similar number of outdoor walks. Alternatively it’s £3.00 on the door for non-members. Meetings are listed in the Peak Advertiser and at Bakewell Tourist Information Office or visit the BBSG web site at www.bakewellbirdstudygroup.org.uk or call 07768 928432. This entry was posted in Group Update on 13th August 2018 by Webmaster. The Bakewell bird study group magic held as usual with the weather with no rain during the trip. The lighting was not best for identification but persistence paid off and we identified a total of 44 species. The varied habitats in the Carr vale reserve make for a wide variety of birds as it is a mixture of open water, marsh, wet and dry grassland, scrub and trees. It was generally felt however that there should have been more waders down on the lake at this time of the year so a little mystery there. All in all a great trip. Many thanks to Dorothy for organising the trip and to Stuart for passing on his special skills at identification. This entry was posted in Report, Sightings on 5th October 2017 by Webmaster. Do you feed the birds in your garden, listen to their songs and sometimes wish you knew the names of some of the less common ones that visit? Perhaps you enjoy walking in the countryside, observing the birds as you go and can identify most of them, or are already a seasoned birder. Whatever the depth of your knowledge, if you appreciate and enjoy the richness of the birdlife around us, then Bakewell Bird Study Group is sure to have something in their programme of meetings to interest you. On the second Monday evening of each month from September through April members and interested visitors meet at the Friends Meeting House, the group’s regular venue, for interesting presentations on bird related subjects. These are given by invited individuals, experts in their fields, accompanied by beautiful photography. Our autumn programme of meetings commences on Monday 11th September at 7.30 pm, with a presentation by local naturalist Paul Bingham, ‘Namibia and Its Wildlife’, which concentrates on spectacular landscapes and wildlife. Although mostly desert, the variety of landscapes and wildlife makes this one of Africa’s most impressive countries. A 3,500km drive visits deserts, the world’s highest sand dunes (350m high), the spectacular Skeleton coast before returning inland through rugged landscapes to Etosha, one of Africa’s most famous national parks rich in mammals and birds. Our photo shows a rather scary looking Secretary Bird. Future presentations this season will include Alaska, Norfolk, Varanger Fiord and Shetland with a talk on water voles in Derbyshire thrown in for good measure. Why not come to our first meeting and join the group? It’s only £15 per annum and for that you get seven talks and a similar number of outdoor walks. Alternatively it’s £3.00 on the door for non-members. Meetings are listed in the Peak Advertiser and at Bakewell Tourist Information Office or visit the BBSG web site or call 07768 928432. This entry was posted in Group Update on 16th August 2017 by Webmaster. 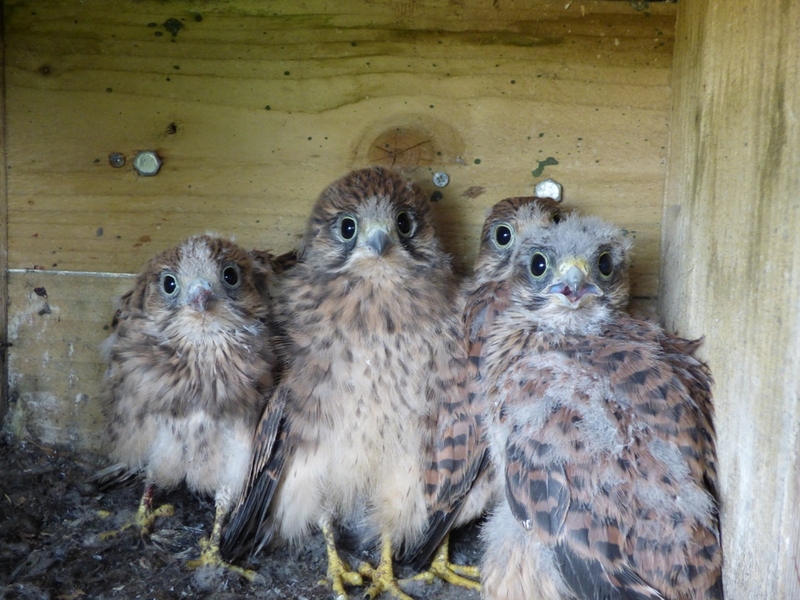 Photograph of a brood of Kestrel chicks in a box made by Brian and put up by him only last year at his Lincolnshire reserve. Photograph subject to owners Copyright, reproduced here with permission. This entry was posted in Sightings on 19th July 2017 by Webmaster. We all met up at Slack’s coach garage at the appointed time and it was nice to see a very near full coachload! The weather wasn’t the best with rain and wind forecast but clearing later in the day. The journey was smooth and steady with a brief stop at a service station and took approximately 2 ½ hrs. The first bird we saw even before we got off the bus was a surprise, A cockatiel! Obviously someone’s pet that had escaped and found its way there. The weather as it now seems usual for our trips defied all the odds and remained mainly dry and the wind was actually warm and not at all unpleasant. We left the visitors centre and made our way en mass around the cliff tops. We had a very good 5 hrs to study the cliffs including a stop for lunch and saw 30 different species in total. We don’t expect many at such a site so that was actually quite an impressive number. Stuart was on fine form as ever pointing out different birds and providing specialist knowledge for example correcting myself when I spotted a couple of pigeons tucked in a crack and told me they were actually rock doves and explained that they mated with ordinary pigeons and there were now very few true rock doves left. The journey home was a mirror image of the journey out and ended at Slack’s garage in unfortunately a downpour! All in all another great trip out so I am sure all those who attended will join me in thanking Dorothy for her time and effort in making the day a memorable one. Bird list: Fulmar, Gannet, Cormorant, Grey Partridge, Pheasant, Herring Gull, G B B Gull, Kittiwake, Guillemot, Razorbill, Puffin, Rock Dove, Stock Dove, Woodpigeon, Skylark, Sand Martin, Swallow, House Martin, Meadow Pipit, Dunnock, Blackbird, Sedge Warbler, Whitethroat, Jackdaw, Carrion Crow, Tree Sparrow, Goldfinch, Linnet, Reed Bunting, Corn Bunting, Common Crane, Cockateil. This entry was posted in Report on 27th June 2017 by Webmaster.